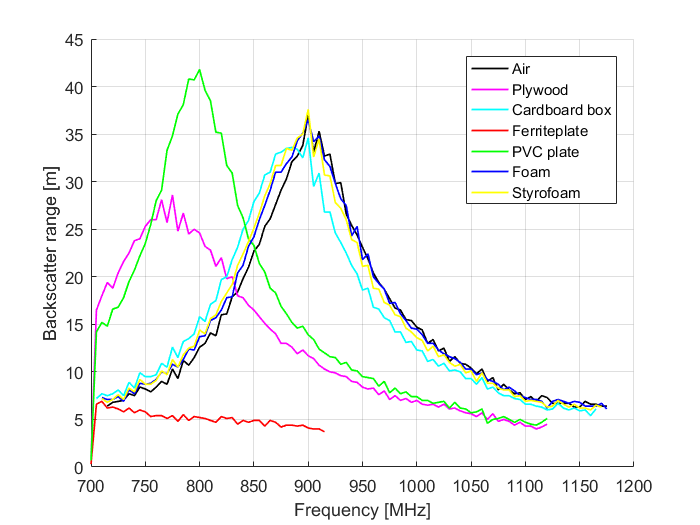 [SOLVED] UHF RFID: Why are read range (forward) and backscatter range curves different? My test setup consists of a reading device with a sensitivity of -70dBm and an antenna gain of 6dBi. I made a frequency sweep across 700 - 1200MHz bands, the device sends a query command (ISO 18000-6C/ISO 18000-63) at increasing power levels (power step = 0.1dBm up until 30dBm ERP) until the transponder responds. Path losses have been measured beforehand so after this frequency sweep, the read range and the backscatter range can be calculated (see figures below). Now as far as I understood, the actual read range is limited by the lower value, in this case the actual read range would be the forward read range depicted in figure 1. I was able to verify this (with small differences in actual range) with a different reader setup. What I do not understand is why the curves are fundamentally different. I would have expected them to be at least a little similar. There appear to be two resonance points in figure 1 while there is only one in figure 2. 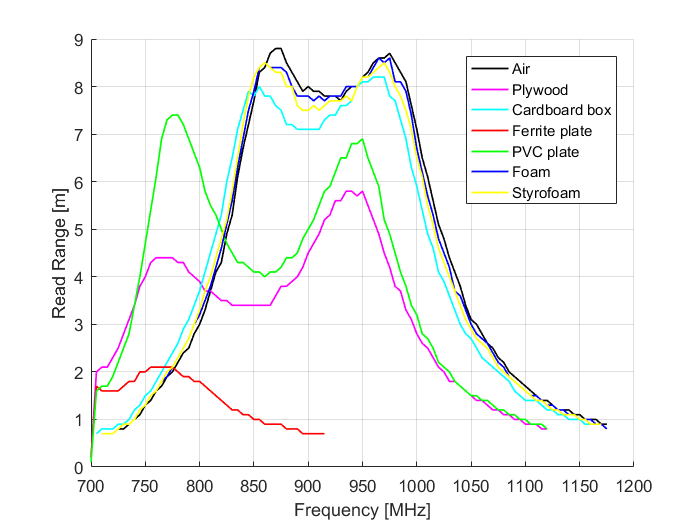 Another point to consider is that plywood and the PVC plate seem to have a strong detrimental effect on the reading range even though the permitivity of those materials should be closer to 1. Edit: There seems to be a smaller, rectangular loop on the tag, is one of the resonance points appearing because of that? You don't give much detail on your experimental setup or indeed what you've exactly measured, and you mention these figures are calculated. In the first case I think you're measuring the ability of your transmitting antenna to couple energy into the receiving antenna, and you get the classic two peaks you'd expect with two loosely coupled [somewhat] tuned antennas. If I understand your second graph what you're showing is the sensitivity of your antenna and receiver to receive backscattered signal, so this is the merely response of your receiving antenna and amplifier. There's no coupled system and you get a single peak corresponding to the response of your [somewhat] tuned antenna. Actually you can see the permittivity effect quite nicely, for your received signal (2nd graph) it lowers the tuned frequency, and for the coupled graph you can see it affects the position of only one peak (the slight motion of the second being due to compositing it with the rapidly falling tail). I have edited my question. 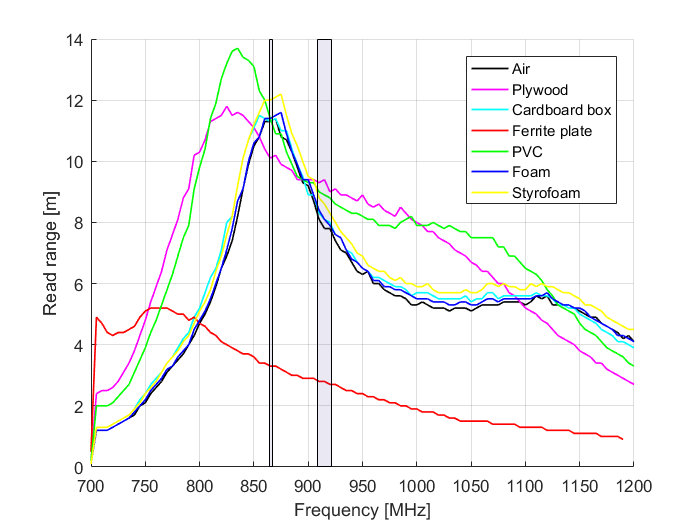 Wood shouldn't have a big detrimental effect on the read range though, it strikes me as very strange that the read range drops almost by more than 50% when compared to free air. Especially when other label-tags are almost unnaffected by wood or plastic. Is there any reason why this specific tag could have worse performance on wood? I have tested 5 copies of the tag and have not noticed any deviations. I thought you said it was plywood, not wood? Even if it were pure wood rather than wood soaked in poly-urethane or urea-formaldehyde , it will depend significantly on the moisture content. If you want meaningful comment on the experimental setup, you'll need to provide pictures, careful explanations of what you did and how you measured it - everything I'd need to know to exactly replicate your experiment in my lab, as your results look entirely like what I'd expect if I did that experiment. You are right, I meant plywood, sorry. I do not have access to the lab until next week so I can't provide pictures right now. The measurements were done with a tagformance lite device. I have added another graph showing read range of another label tag. I would have expected similar results regarding frequency shifts. The first tag seems to be much more sensitive towards higher permittivity objects. Passive RFID tag - link between size of antenna and read range (detailed)? [SOLVED] What are line-of-sight limitations of UHF RFID readers? How to use Antenna to amplify RFID read range? [SOLVED] Why can a UHF RFID antenna read a LF tag?